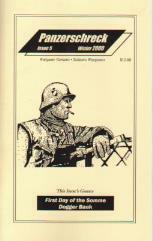 Features variants for Wolfpack (SPI), Operation Olympic (SPI), Berchtesgaden (Minden), Hitler's War (AH), Retro ASL, Assault on Tobruk (SimCan), Jewish War (Khyber). Issue Game: First Day of the Somme (solitaire operational WWI). The player (British) must plan and execute the Big Push of 1916, using divisional units and three hour turns. After the whistle blows, he must watch and see how his plans fare. The game simulates the battle on July 1st, 1916. Issue Game 2: Dogger Bank: Battlecrusier Action in th Great War (two-player tactical naval WWI). Naval combat during the Great War between individual British and German battlecrusiers in the North Sea, January 1915. Mini-Sim Game: Commando Raid on Rommel (solitaire tactical WW2). The player (British) executes a commando raid on the coast of North Africa in an attempt to eliminate the Desert Fox.